Growing up in Hastings, there was always a joke that the town was so full of nutters because they were all given a one-way train ticket from Hellingly mental hospital. It may even have been true. Situated in a remote pocket of the East Sussex countryside, even the name of this early-Edwardian institution conjured up an evocative image of - well - Hell. It closed around the time I left Hastings for the more civilised surroundings of Brighton in the mid-80s, but it always retained its fascination for me. So when the news came that it was finally due to be demolished in early 2010 to make way for a luxury housing estate, a couple of mates from Hastings suggested a photographic mission to capture the last days of this once magnificent building. We deliberately chose the last Sunday of the year, the day after Boxing Day, when we figured security would be low. Demolition was already well under way lower down the site, but the part we were heading for was as yet untouched. A couple of our small party had already been in and had previously been challenged by security, who have a tendency to patrol with fearsome dogs. The day turned out to be perfect: bright sunshine, chilly and crisp, so it was over a security fence, through a bramble bush, under another fence, more brambles, up and over through a window, then another, and we were in, unchallenged. 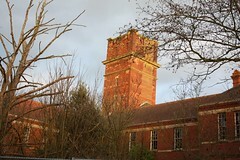 The building is amazing: a huge red brick construction dominated by a large water tower; corridors with more corridors off them; a huge ballroom with an arched ceiling bearing ornate ceiling roses and the remnants of what must have been beautiful stained glass windows; hydrotherapy baths with sinister-looking knobs and dials; the smashed remnant of a hairdressing salon; long ward rooms; tiled kitchens and bathrooms. It's a warren, with angular corners giving the feeling you could walk forever and disappear into an infinite architectural fractal. Many of the corridor roofs have collapsed, and floorboards are perilous, partly through rot and partly vandalism. Numerous fires have been set and every single fixture, fitting and pane of glass has been destroyed, some by intruding vandals, and no doubt others by the developers to deter architectural salvage. Despite that, there's still enough to see to conjure an image of what it would have been like: remnants of wallpaper, remaining fireplaces, signs, a room full of hoists and other medical implements, the cracking paint revealing fragments of previous layers of colour, tattered orange curtains flapping as nature's green tendrils creep in through shattered panes. One of the most fascinating aspects is the graffiti. Alongside the usual scrawled knobs and obscenities, artists have used the building as a canvas for an inventive series of works: a ghostly woman rising from a bath; a top-hatted tailcoated figure in the corner of the ballroom; two creepy Victorian girls by a doorway, all adding to the atmosphere of a place where misery, tragedy, fear and joy would have commingled for eight decades. My pictures are on Flickr but for some reason I can't link to them, but the link to my site is in the left-hand bar here. There's also a link there to Hellingly on Google Earth - catch it while it's still visible. Last night I was DJing at the Marlborough and, failing to find a taxi by phone due to the wintry weather, slithered down the road to hail one off the street. I lugged the Technics, CD mixer, bag of records and bag of CDs into the boot while he watched and we started off with one of those conversations of niceties, y'know "How's it been tonight? ", "What do you do for a living?" sort of thing. Then I made the mistake of slagging off the council for not gritting the pavements which have turned into sheets of ice, everyone slithering about and lots of people falling over, wondering about the cost of gritting versus the cost to the NHS of all the people who'd be using their services that night. Big mistake. This brought on a tirade against the council, how evil it is and how all the staff should take a pay cut. Forced to defend my Trades Union colleagues, the driver then admitted his politics veered toward the communist. Me: Ah well, we remember when the Labour party at least had some socialist principles. I don't know who a socialist could vote for these days. Taxi Driver: Mind you, if that British Party toned it down a bit, lots of people would vote for them. TD: Was that the wrong thing to say? TD: Mind you, that Nick Clegg's an idiot. Me: Yes, he's a moron, but a dangerous one. TD: I'm not anti-semitic though. Me: Err, good. They just hate anyone who's not white and anglo-saxon. TD: I do like dark-skinned women. Me: [pauses to think for a moment] Well I quite like dark-skinned women too. TD: [quick as a flash] I thought you might. Don't get me wrong, but I thought you were a bloke when I picked you up. Me: [laughing] Don't worry about that! TD: I was in the merchant navy for 20 years and if I learned one thing, it's not to be homophobic. Me: Good for you. It doesn't matter what people do if it's not hurting anyone. It's none of your business. Live and let live. TD: I wish people would do that. Mind you, I don't think we should disarm if everyone else has weapons. Me: Oh, so you're a multilateralist. TD: I don't know anything about that. I bet you went to university. Me: Uh, a bit later in life. TD: [doing a U-turn at the bottom of Edward Street to turn past the Marlborough] If you'd told me you were a copper I wouldn't have done that. TD: [as I was lugging the Technics, CD mixer, records and CDs out the boot onto the icy road] I used to be a champion weightlifter you know. Me: Uh, call it seven quid. TD: Thanks very much. You seem like a very unprejudiced person. And shaking my hand, he bade me a very good night, and drove off into the icy night to flummox his next passenger.